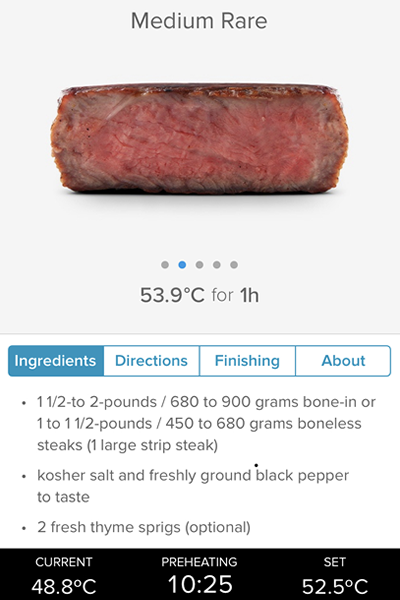 Did you ever dream you could use an app on your mobile phone to cook steak perfectly? Some people go to culinary school to learn to grill a perfect medium-rare porterhouse. Those same people take most of their adult life to perfect the process. 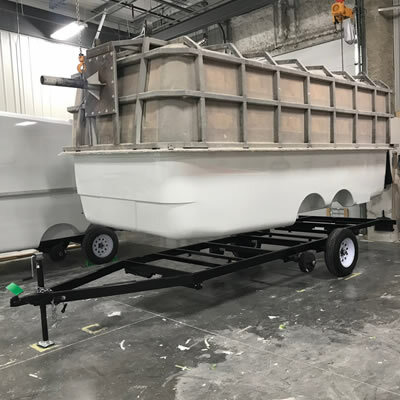 They can grill on whatever medium is available, from scrub mountain spruce, smoldering birch or Mexican mesquite to natural gas and even pressed charcoal briquettes. But now any home cook can prepare a perfect medium-rare steak with a Bluetooth-linked app, a sous vide machine wand and a resealable plastic bag. Sous vide simply means cooked under vacuum in a hot water bath. It’s a technique that restaurants have been using for decades––it’s how some kitchens prepare your order cooked perfectly­­––and fast. Proteins, especially steaks and chops, can be cooked to rare or medium rare (or even well done if you choose) and held in the hot water bath at temperature for up to three hours. When it is time for dinner, sear steaks in a very hot fry pan for two to three minutes on each side and dinner is served. If you went to culinary school, you will feel cheated. If you didn’t, you might feel like you stole something when you taste the results. ChefSteps and ANOVA both manufacture precision sous vide machines. The lower part of these machines sits below the surface of the cooking water to circulate and heat the water precisely. 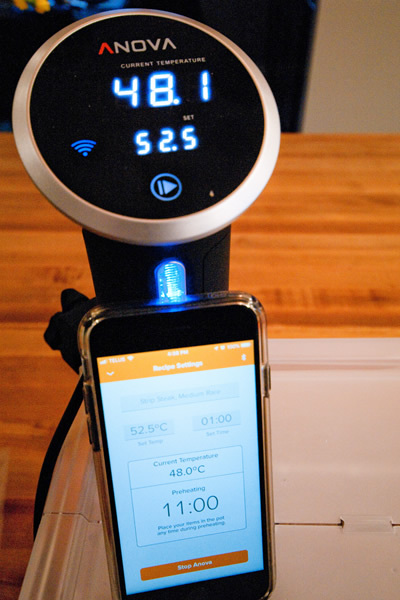 Sous vide “wands” manufactured by ChefSteps and ANOVA both come with Bluetooth-enabled apps so you can control the cooking process from your mobile phone. The apps come preloaded with a number of recipes and a visual doneness scale so you can choose how well done you want the end product and set the controller from your phone. The LIPAVI Sous Vide Systems have custom-cooking containers that hold the perfect amount of water, hinged lids and optional stainless-steel folding racks to expand the usefulness of your sous vide cooker. Sous vide allows cooks to deliver perfect doneness in their time frames because food can be held for several hours. This allows RVers to have a perfectly cooked dinner ready just a few minutes after returning from a day’s exploring. Or hosts can prepare the meal ahead of time and then serve guests when they arrive anytime in a three-hour window. Cooking in a water bath adds flexibility to your cooking methods. For example, you can season, vacuum package and freeze steaks. When ready to cook, put the packages directly into the water bath and cook right in the bag. The first step in sous vide is to season and seal the raw food in a bag. Vacuum packing works best but resealable plastic bags work in a pinch. Next, set up the water bath. LIPAVI has specially designed polycarbonate containers for sous vide cooking but a variety of containers will work, from Dutch ovens to picnic coolers. Fill the container with enough water to cover the food to be cooked. Insert the sous vide machine to the recommended level in water, and set the controller. As soon as the water reaches the target cooking temperature, immerse the sealed food in hot water. The machine will circulate water and maintain a precise temperature. Use the mobile phone app to determine the appropriate recipe and doneness and set the app. The app will notify you when the food is cooked to desired doneness. When the cooking cycle is finished, the machine automatically holds the food at a safe temperature. Remove the food when you are ready to sear and serve. Foods such as a beef steak need a quick sear finish in a smoking-hot fry pan or mark on a preheated grill. 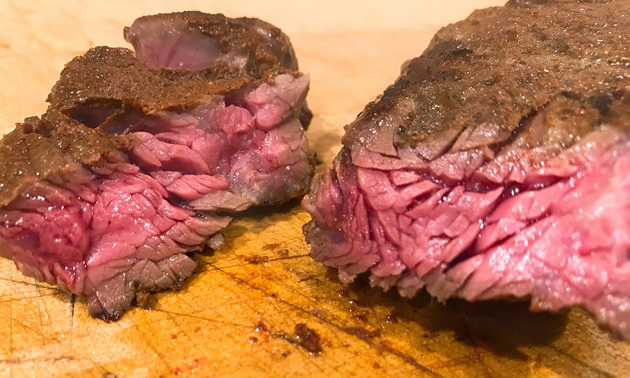 With sous vide, every home cook has immediate access to perfect doneness without years of practice. I recently cooked lamb shanks for 24 hours for a melt-in-your-mouth doneness. A quick brown in a 260 C (500 F) oven put the final touch on the shanks before serving with risotto and steamed vegetables. The truth is I am that guy who went to culinary school to learn how to cook a porterhouse. And I took a lifetime perfecting my grilling skills on any cooking medium. This is a point of personal pride. 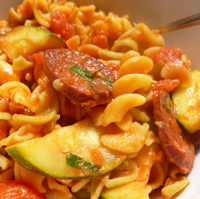 This delicious and easy pasta recipe is provided by a cookbook dedicated to quality food while on the road. Snowbirding 101 blogger tries her hand at stringing chiles and offers up some of the Chile Institute of New Mexico's best recipes.